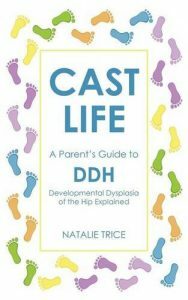 "Natalie Trice is a strong advocate for those who are affected by hip dysplasia." My second son was born with Developmental Dysplasia of the Hip (DDH) which changed the course of our lives. 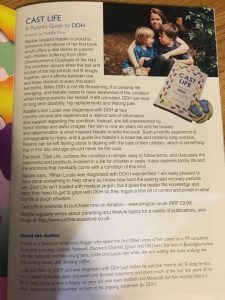 His brave journey, and a lack of information and support for parents, inspired me to write ‘Cast Life – A Parent’s Guide to Hip Dysplasia’ to help others and raise awareness of this common but unrepresented condition. When a child is diagnosed with DDH you experience a range of emotions and responses. Once the shock wears off, you want to understand not only the condition, but also what the future holds for your child and how you can ensure they have healthy hips for life. Together with the help of leading orthopaedic surgeons, experts and other parents, I believe Cast Life covers everything parents, carers and even professionals, need to know about DDH. I don’t bombard readers with medical jargon, but equip them with the knowledge and facts they need to understand and get to grips with DDH. From symptoms and explanations of the condition, to details of the treatments involved, it is all in there in black and white. Cast Life is published by Nell James Publishing and available from Amazon, Waterstones and outlets around the world. DDH UK, is the charitable trust we created and one that offers 24/7 global support and I also sit on the Advisory Board for the International Hip Dysplasia Institute. I have been commissioned to write two more books with Nell James Publishing and expect the first to be out in 2019. My first book, was an e-book and is entitled Writing a Press Release – An Art, Not Rocket Science.